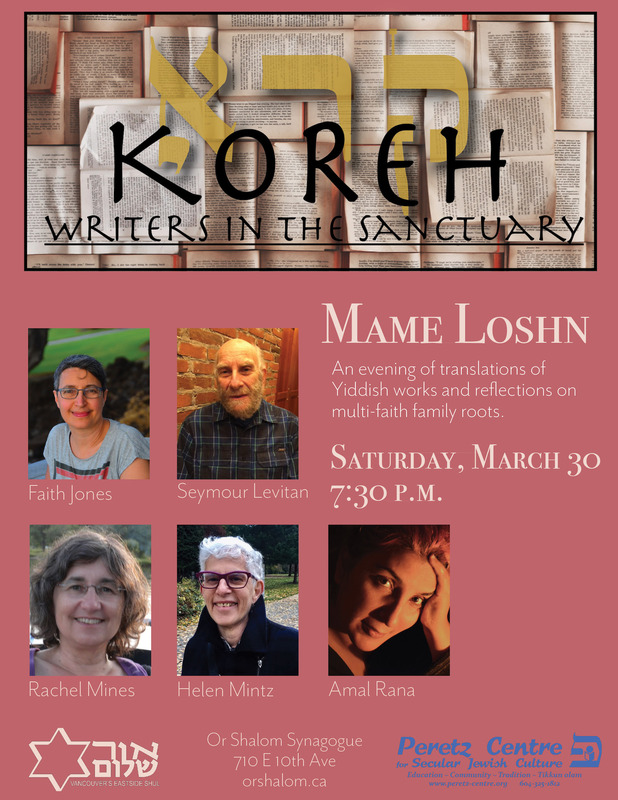 KOREH/קרא is a series of events featuring Or Shalom writers and friends reading in the Or Shalom sanctuary. The evenings will alternate between curated readings and story/poetry slams inviting your contributions. In exploring the connection between artistic expression and identity, our intention is to honour the writing and story-telling talent in the greater Or Shalom community and to open Or Shalom as space where artistic practice is celebrated. Karen X. Tulchinsky a.k.a. Aren reads from his novel-in-progress set in 1930s Berlin. Mame Loshn, which means mother tongues, will feature Faith Jones, Seymour Levitan, Rachel Mines, and Helen Mintz, four Yiddish translators who will be presenting a range of Yiddish works from Ashkenazi communities, in English translation. The works they have translated range from fiction to poetry to erotica. Amal Rana will be presenting a work-in-progress exploring her relationship to her white Jewish grandmother and growing up in a mixed faith, mixed raced family. It’s a mix of memoir and poetry — a work of poetic memoir. Read more about the presenters. 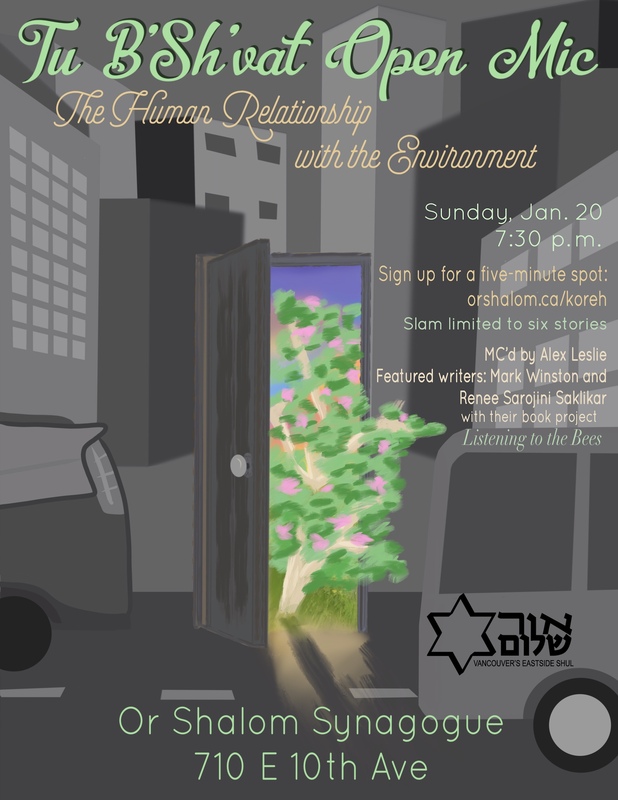 Sunday, January 20, 7:30 p.m.
Our next Koreh will be on January 20, 2019 for Tu B’Shvat (the New Year for Trees). The open mic filled up fast with folks wanting to share a story, poem, or song about the human relationship with the environment. We’re looking forward to their offerings as well as hearing featured writers Mark Winston and Renée Sarojini Saklikar. We acknowledge that this event takes place on the traditional unceded territories of the Musqueam, Squamish, and Tsleil Waututh people. Read more about each of our writers. Saturday, Sept. 1, 2018, 8 p.m.
Wayward Wandering and Return, a Teshuvah-themed story slam for the eve of Selichot. This evening will include six five-minute slam stories and an original work by story teller Cecil Hershler. Sign up here to read your original writing at this story slam! The evening will begin with Havdalah and end with a Kol Nidre improvisation played by Dave Kauffman and Martin Gotfrit. Never been to Or Shalom? Come see what our warm community is all about. Email our program coordinator if you’d like to connect with someone at our synagogue.